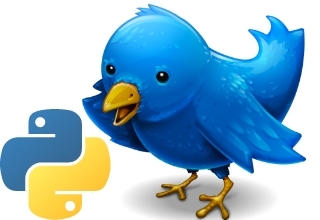 Over the past few weeks I have been accessing Twitter API from python using tweepy. In the course of doing so, I added support in tweepy for using multiple authentication handlers, monitoring rate limits, waiting when running out of calls, support for search using Twitter API v1.1, proper pagination of results and more. In this blog post I will describe the major changes in my forked version of the tweepy package and provide some best practices and examples for querying the Twitter API robustly. Fork me on GitHub or follow my pull request on the main tweepy repo #282 to get the complete code referenced in this post. Monitoring rate limit: switching authentication handlers manually is nice, but it is far more useful to have tweepy do that automatically based on the number of remaining api calls. The monitor_rate_limit argument does exactly that - monitor to number of remaining calls to the Twitter API endpoint and switch to the next authentication handler when running out of calls. This feature lets you be a good citizen and not supersede your API calls quota. Blocking when running out of calls: using the argument wait_on_rate_limit you can have tweepy wait when running out of calls. By monitoring the http headers returned from Twitter, tweepy now knows exactly how long to wait until the next lump of api calls is available. This is useful when you need more than the number of calls allowed by the rate limit, but don't want your program to fail with an exception or lose track of the current position in your results. Proper iteration of result pages (pagination): prior to my forked version of tweepy, if you used the Cursor object to iterate over results you probably have missed some tweets in your result set. A good explanation of why this has happened is in Twitter own documentation on working with timelines. Now iteration uses max_id parameter to properly traverse results when using the cursor object. If you're wondering what's happening behind the scenes, take a look at MaxIdIterator class in tweepy/cursor.py. Search endpoint now supports Twitter API v1.1. Unit testing for all of the above. Have a comment? an idea of how to do things more elegantly? leave a comment or contact me on twitter @grinbergnir.